Marketing is thriving. In a world where too many companies are fighting for the same customer, hiring a good marketing specialist is what makes the difference. If you’re serious about working with leading global brands on their marketing strategies, you’ve come to the right place. 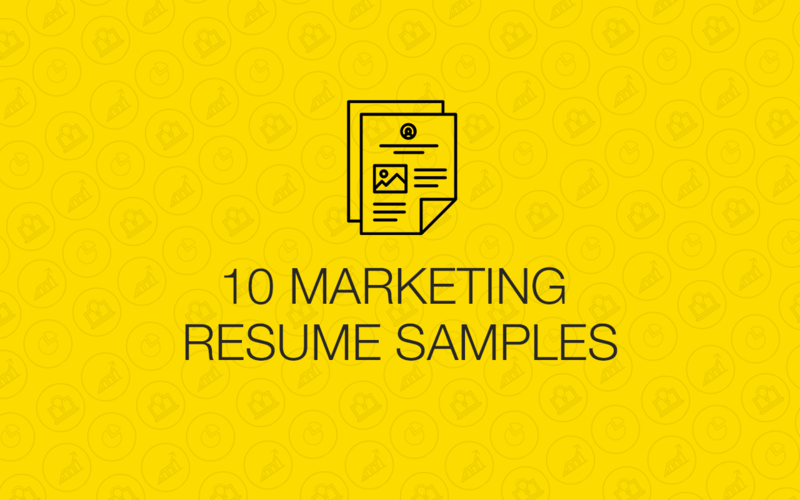 We’ve put together 10 real marketing resume examples by real people who got hired by the world’s top companies. Why not learn from those who already know the way? 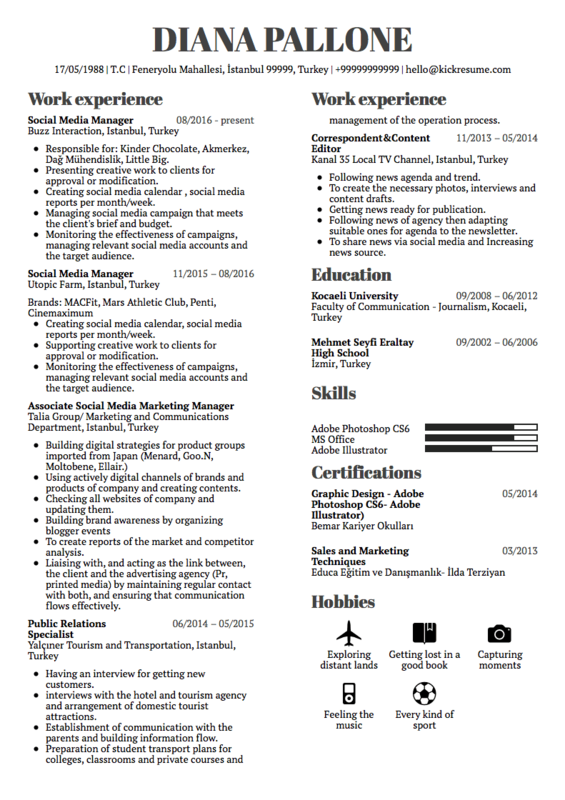 A marketing resume simply needs to sell itself. But how? First, you need to fill the resume with relevant information. Second, put it into an attractive shape. And these two steps need to complement each other. A great form without content is the same as great content without form: a missed opportunity. 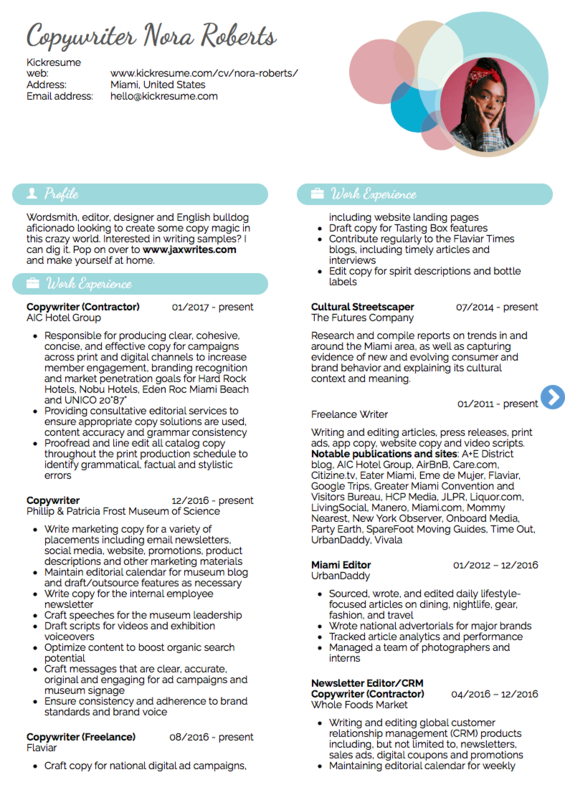 Our real marketing resume samples will help you see the impact of the form and content going hand in hand. 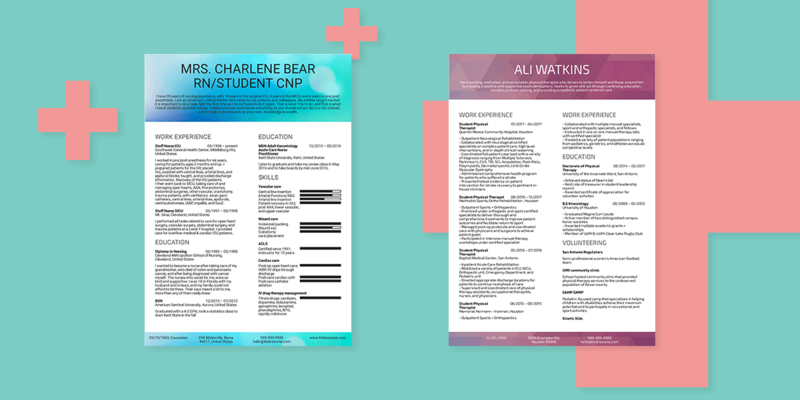 And if you feel like you still need more guidance, check out our ultimate resume guide or download our ebook, completely free of charge. If you’re applying for a senior position, you can get away with a wordier resume. The point is to describe your wealth of experience in a sufficiently detailed manner. Still, this resume could benefit from a clearer structure. Although it’s divided into several sections, it’s structure within these sections leaves much to be desired. Remember that nobody likes reading walls of text. When writing a resume of your own, try to use bullet points. They make your resume nice and easier to read. Nike is a global, trend-setting brand. If you want to become one of the company’s marketing specialists, you need to show that you know where you’re heading too. 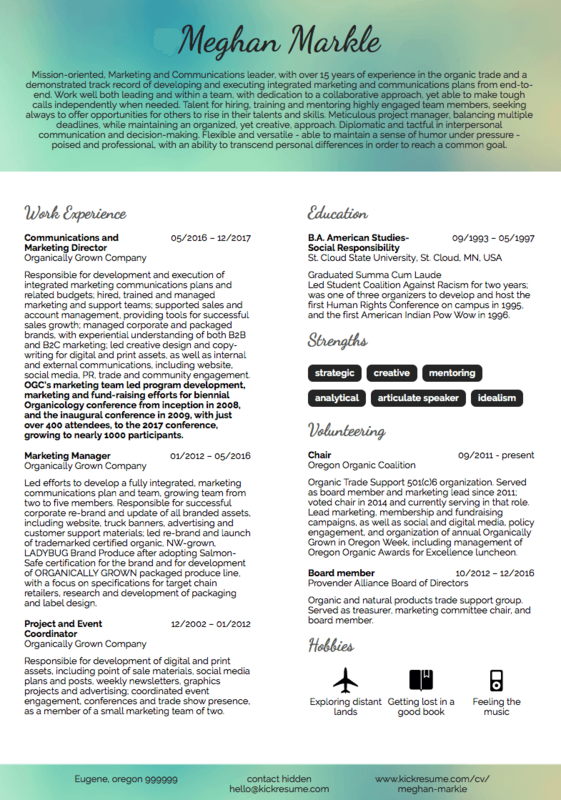 This marketing resume examples shows a young individual with a visual taste that matches the company’s energy. 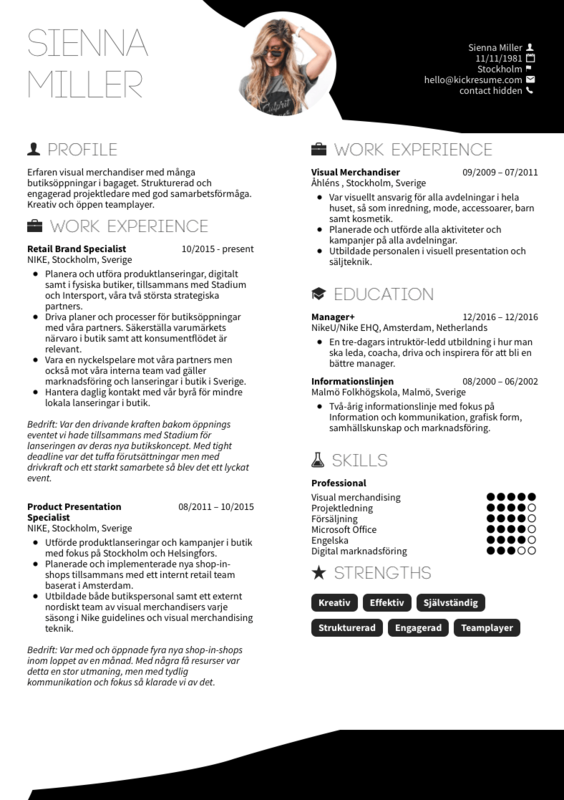 You don’t even need to speak Swedish to see the features that make this resume readable. Look at the balance between paragraphs and bullet points and how they convey the message in a different way. Bullet points talk about the applicant’s key responsibilities, each line being introduced by a powerful action verb. Short paragraphs in italics, on the other hand, contain the applicant’s first-person narrative of challenges and professional achievements. 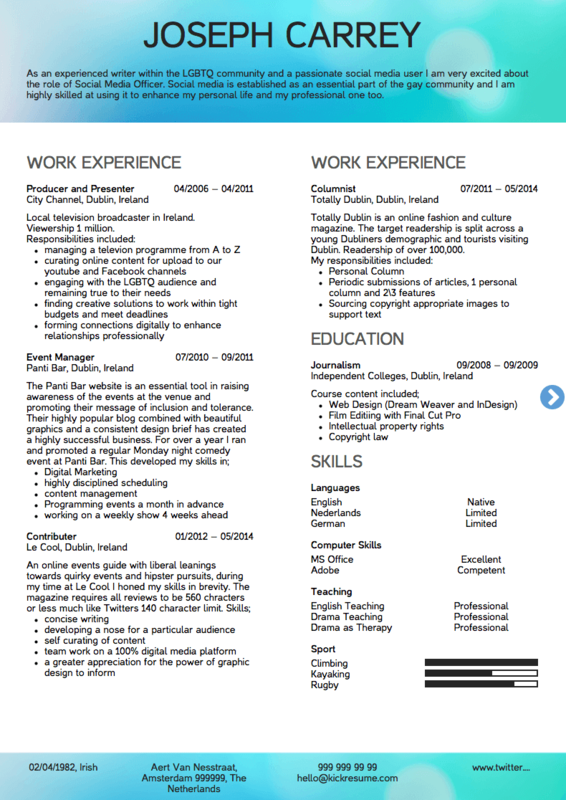 The following resume boasts an especially powerful Profile section. It includes the most important pieces of information in just four sentences. Nothing unnecessary or non-relevant. A comprehensive summary helps you prioritise information you want the hiring manager to see first. For Aisha Hakim, this meant highlighting his extensive experience and admirable linguistic skills. A smart move that got him hired at such a multicultural company that Sheraton is. First, the length of this resume is fairly impressive. But hey, it’s no fluff — only relevant work experience. However, it might surprise you that older jobs are lacking a description. Why is that? If you have a long story to tell, remember to focus on the 3-4 most recent jobs you had. It’s very likely that hiring managers won’t be very keen on reading an extensive chronicle of your whole professional life. Also, there’s simply no better way of demonstrating your achievements than with numbers. 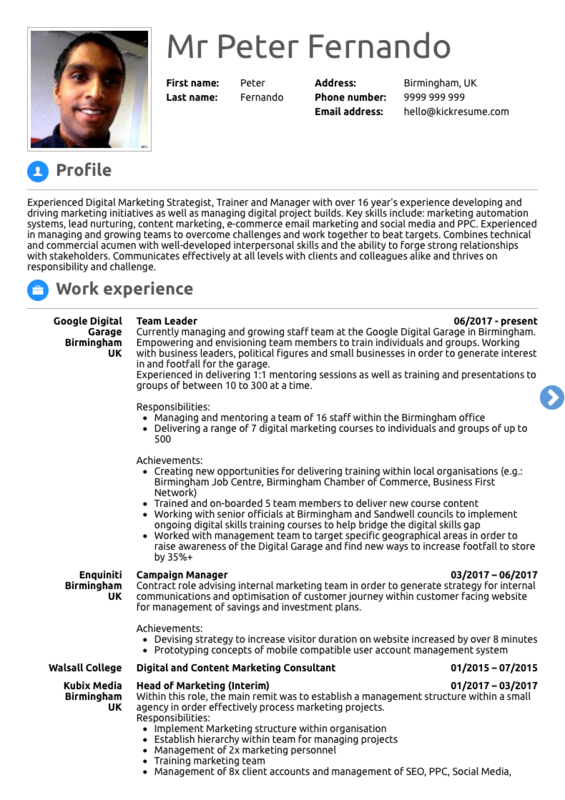 Notice how numbers appear throughout the whole resume wherever possible. If you can quantify your career, do it. Google likes it. Students and fresh graduates often lack experience but exude passion for what they want to do. To write a good internship resume, you need to describe yourself as a motivated and enthusiastic individual. 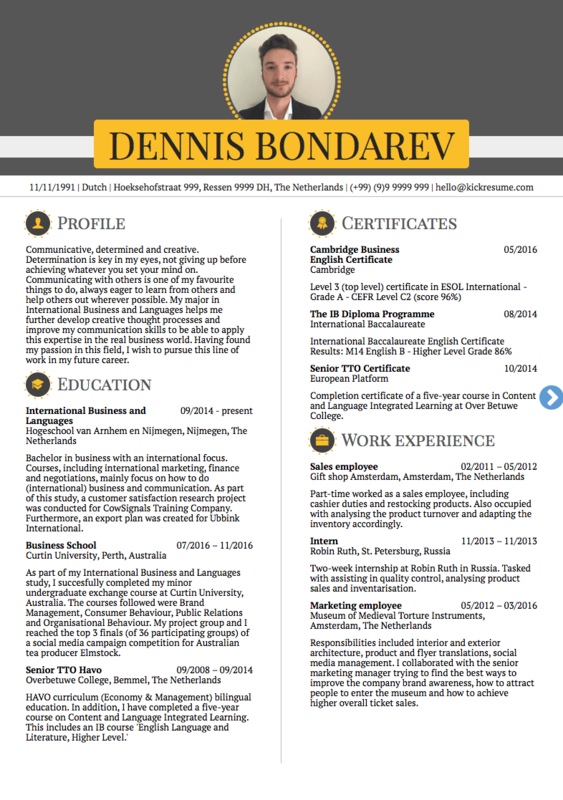 So what’s the secret of Dennis Bondarev’s resume that got him hired at Philips? The lesson is — build your resume on your strengths points, not weaknesses. Focus on your soft skills, highlight your education and show off the certificates that you’ve earned so far. And then just watch your experience grow with every internship you get. The marketing resume of Juliam Prim won’t tell us what he looks like, but we know he scored a cool job at Yamaha. If you want to learn more about the inclusion of your photo on your resume, here’s what experts’ have to say. Besides the photo, what makes this one so special? See how the bullet points govern the structure of the resume and list the key responsibilities under each position. Also, notice how the visually dominant labels help the hiring managers see the chronology in the experience and education sections. A smooth journey, so to say. Marketing is tied closely with the company’s philosophy and its objectives. And it’s the social media officer who is responsible for shaping the voice of the company in the online world. The introductory paragraph of Joseph Carrey’s resume conveys a clear message: “I share your values and vision, and we will work towards a common goal.” Don’t shy away from including details from your personal life if it has something to do with the position you’re applying to. After all it’s stories we live, not dry facts. 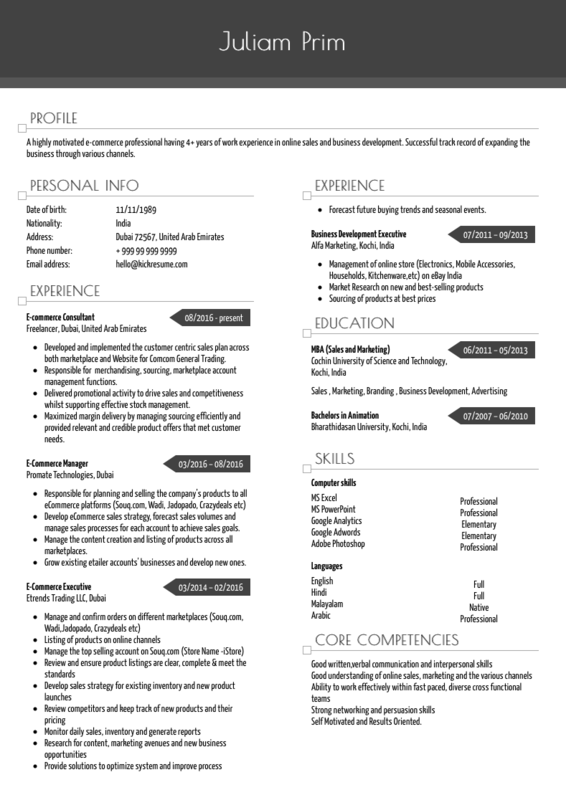 See how the clean layout and logical structure makes the resume easy to read. The bullet point is not the only tool for listing individual tasks in your Work experience section. Instead of bullet points and commas, you can come up with something more creative like vertical lines to divide your keywords. Being able to present yourself is one of the key skills the hiring managers seek. If they can see that you have a knack for the art of presentation, they’ll instantly recognise your potential. Marketing is all about customers’ eyes. 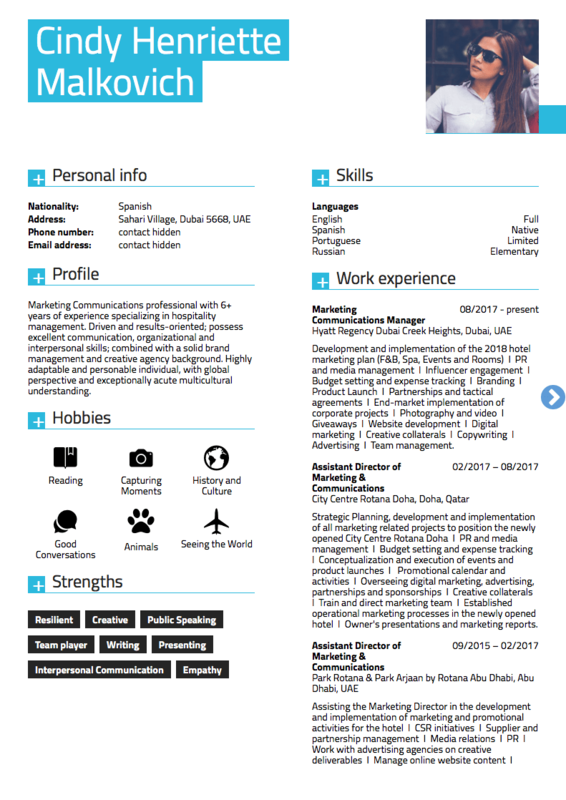 The bullet points introduce key responsibilities in short phrases and give the resume sample a powerful visual element. One may argue the icons for the job seeker’s hobbies are redundant, but they are sure catch the reader’s attention. The position of copywriter at Hard Rock Cafe asks for something eccentric, and that’s exactly what this resume stands for. It’s bold and creative, uses bright colors and an unusual font type. Unless you step into the realm of Comic Sans, there’s a high chance you can pick an original typeface that the hiring manager will appreciate. Use it for the headlines, but keep the body text clean by using one of the standard fonts like Verdana, Arial or Times New Roman. Also, one of the smart ways to demonstrate that you are skilled in communication is including your social media accounts. But don’t forget to clean them up first! 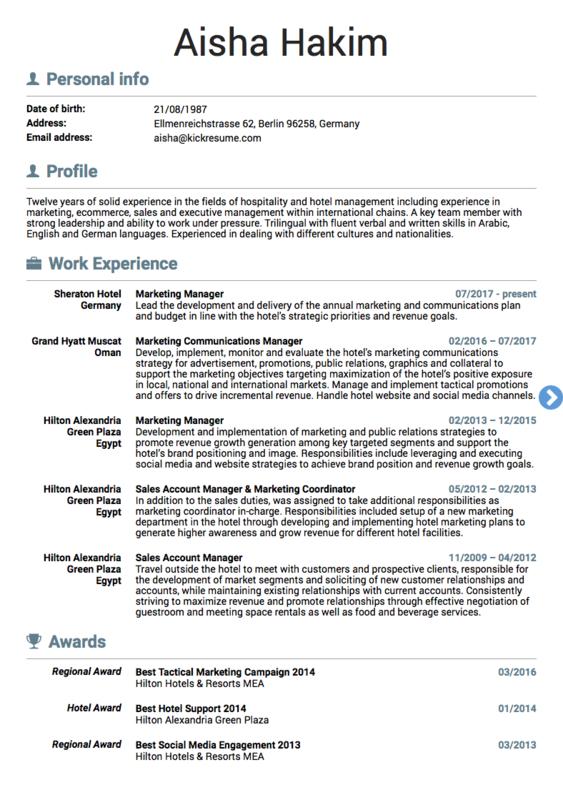 Want to see more resume examples from people who got hired by the world’s top companies? Check out our Resume Library!